Employers want new lawyers to find innovative ways to add value for their clients. But aside from anecdotes and intuition, law schools do not have a reliable way of measuring — or even describing — what employers are looking for. That is why Daniel Linna, director of LegalRnD – The Center for Legal Services Innovation, and his team at Michigan State University College of Law launched the Legal Services Innovation Index, a new initiative that tracks and measures innovation in legal education. Of the 38 schools that are currently being tracked for innovation, 19 have a center, 10 have a concentration, eight offer executive education or continuing legal education courses and seven host clinical opportunities for students. Popular courses include Business of Law, Innovation and Entrepreneurship and Empirical Methods. Linna stressed that the innovation index is not a law school ranking; it does not measure the depth or quality of law school programs. The index is a prototype, he said, meant to serve as a starting point for describing legal education innovation. Future versions of the index might include results from law school surveys designed to identify other innovative initiatives. 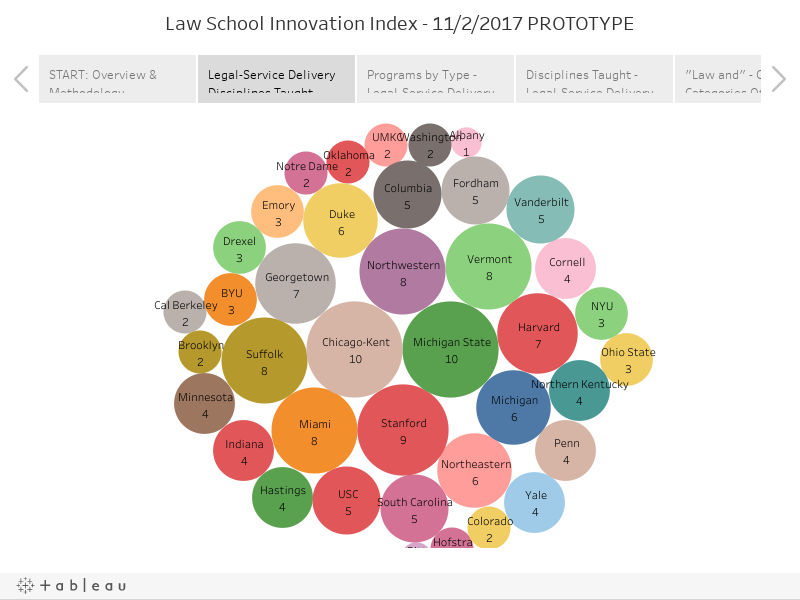 Law schools are not the only subjects of the Legal Services Innovation Index. Law firms are also under Linna’s microscope as well. Linna said the goal of the index is to identify ways in which legal services can be delivered to more people at a lower cost. There are many opportunities to leverage process, data and technology to improve legal-service delivery. The index highlights the law schools graduating students with abilities to seize those opportunities. Click here to learn more about the Legal Services Innovation Index.